We've often looked at digital TV broadcasts tailored for mobile devices, such as the popular systems used in Japan and Korea, but rarely a portable gadget that uses a normal digibox. The first such product to come across our radar is a car sat nav unit from Sanyo Japan that can tune into normal terrestrial digital broadcasts instead of the 1-seg mobile version used there. 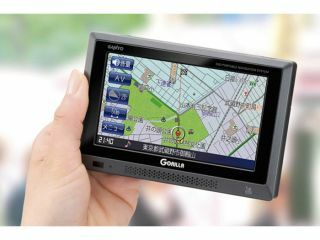 From 20 November Japanese motorists will be able to relax in traffic jams by watching extreme game shows or mindless baseball matches on new 'Gorilla' series navigation units that start at ¥130,000 (£821). Each model has a 7-inch touchscreen and a 4GB SSD containing maps, shop data and information on areas where car break-ins are considered a problem by the local police. Although Sanyo hasn't explained the preference for the full-fat digital tuner over the more lightweight mobile broadcasts, it could be that the weight of millions of 1-seg users unsatisfied with constantly poor reception could be finally coming to bear.